Compact and easy-to-use, the Teriostar 1040-MF Series combines fast mono/colour scanning with high-performance LED mono printing which is ideal for the architecture, engineering and construction (AEC) industry. Fast print speeds - High-performance LED printing with Parallel Processing. 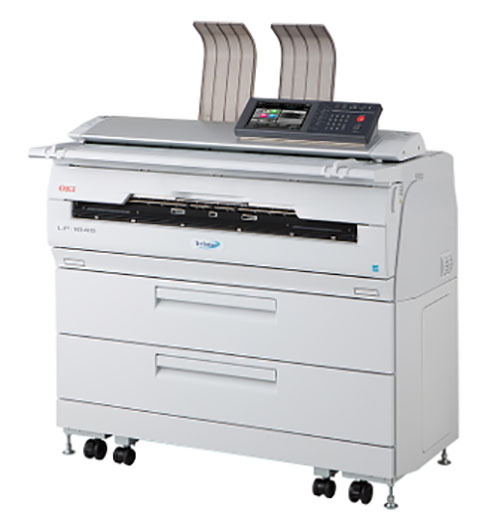 Ideal for the AEC industry, the compact Oki Teriostar LP-1040-MF series combines high-speed printing and scanning with an ultra-small device footprint. High-resolution LED printing and scanning is made easy with a straightforward colour LCD touchscreen panel. Standard roll paper width detection, job control and security features provide added protection and flexibility. Combining a compact design with easy-to-use colour LCD touchscreen panel and a range of performance-boosting features as standard, the Teriostar LP-1040-MF comes with a complete PC-based software suite which supports drag and drop file management, full file view capabilities, a sophisticated print queue along with multiple printer support. Designed for maximum uptime and reliability, the Teriostar LP-1040-MF features a user-replaceable process cartridge and long-life charge wire, reducing service calls and maximising uptime. Sturdy and reliable, Teriostar large format printers are widely used for computer aided design (CAD) and manufacture (CAM) printing and have a strong reputation in the AEC industry.